Marilyn Luce (EMT-P), left, Kevin McGinnis (EMT-P), and Nicole Prescott (EMT-I) demonstrate the preparedness of the Winthrop (Maine) Ambulance Service. Eight years after a national landmark study called for integration of rural Emergency Medical Services (EMS) with other pre-hospital and hospital providers, the EMS industry struggles with an identity crisis and a fragmented system that makes full integration a formidable challenge. Consensus exists that integrating EMS systems will improve availability and access to advanced EMS care in rural and frontier communities, according to Nels Sanddal, a longtime EMS researcher and Manager of Trauma Systems with the American College of Surgeons (ACS). However, EMS’s role in three different arenas—health care, public health and public safety—contribute to the “identity crisis” that makes it difficult to formulate a plan to best integrate all pre-hospital resources. The fact that EMS agencies are governed differently from state to state and owned and operated in many different ways makes it even more difficult to regionalize all the resources. Where these recommendations are being put into practice, results are confirming that the emergency response system gets stronger. This is being demonstrated by programs in Oregon, Minnesota and Maine, which are integrating rural EMS with other services, and improving patient care, EMS response times and provider skills. Simulations conducted like this one in Clatsop County, Ore., help local EMS, fire and law enforcement learn how to better integrate services to provide trauma care. In northwest Oregon, several agencies with special interests in trauma have united to improve trauma care at 15 rural northwest Oregon sites. The sites were selected for full-system activation response trauma scenarios with multiple patients. Robert Burk, an EMT with Medix Ambulance in Clatsop County, was among rural EMS, fire and law enforcement department responders involved in a recent scenario where two vans, fully loaded with students and adults, “collided” near the high school. Hands-on practice included extricating patients pinned in vehicles, treating and triaging patients, and determining transport destinations appropriate to the severity of their conditions. Medix provided ground transport to Columbia Memorial Hospital, a Critical Access Hospital in Astoria, and Life Flight transported critically injured patients to a Portland Level 4 trauma center. Prior to the simulation, Life Flight staff provided a daylong educational session for rural practitioners. Following the scenario, participants met to identify ways to improve the emergency medical response and system of care based on what they learned. Analyses of Pre- and Post-tests demonstrate that rural practitioners’ confidence in providing trauma care has improved, Duehmig said. Duehmig said all simulations include a pediatric emphasis because initial planning indicated that providers had minimal experience caring for injured and critically ill children. To date, five simulations have taken place and four more have been scheduled. Partners in the project are ORH, the Oregon Department of Transportation, Oregon EMS for Children, Oregon Health Authority, and Life Flight Network. ORH funded the project through a HRSA Flex grant. Improving trauma care outcomes is also the purpose of an online course ACS has developed. More than 35 states, along with India and China, have enrolled providers in the Rural Trauma Team Development Course (RTTDC). Minnesota’s Comprehensive Advanced Life Support (CALS) educational program reaches beyond trauma care “to integrate rural pre-hospital and hospital-based emergency care providers into a highly functional team that can effectively care for a wide variety of time sensitive emergencies, including trauma, stroke, heart attacks, shock, sepsis and airway management,” according to Dr. Darrell Carter, a family medicine physician in Granite Falls, Minn. Carter, who developed the concept, worked with a team of EMS practitioners, and emergency medicine and family medicine providers to build the CALS model. One of CALS’ more unusual features is that it takes EMS practitioners into the hospital ER to continue helping with patient care by assisting staff at the hospital in an organized team effort. As a result, Carter said, communication improves among all caretakers, facilitating better patient transitions and quality of care. 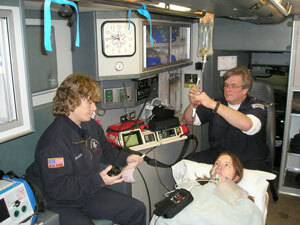 Traditionally, the EMS role has ended with transport of the patient to the hospital ER. More than 5,000 Minnesota providers have received CALS training through funding approved by the Minnesota State Legislature. Wisconsin has developed its own statewide CALS courses under the umbrella of the Minnesota-based program. Minnesota trainers have also taught CALS courses in Nebraska, Michigan, Oklahoma, Texas, Missouri, California and Canada. CALS training is provided for medical personnel who staff all the U.S. Embassies, and a pilot program is underway to adapt the U.S. version for Kenya and other developing countries where missionary physicians want to implement it. Three-year pilot projects under the umbrella of Maine Emergency Medical Services are integrating paramedics and emergency medical technicians (EMTs) into rural public health and medical facilities. Pilot program developer Kevin McGinnis said the projects leverage EMS resources, including EMS mobility and 24/7 availability, to address local health care and public health needs while serving as a practical way to hone little-used EMS skills. Under project guidelines, licensed paramedics who have taken a college-level community paramedicine course can assist primary care providers. Enabled or enhanced pilot projects are more narrowly scoped to allow EMTs and paramedics to work under a physician’s supervision on specific community projects. Rural communities define the projects. For those projects to be approved, “they must demonstrate integration with community health teams,” McGinnis said. Maine has long integrated fire and EMS services in rural communities, McGinnis said. 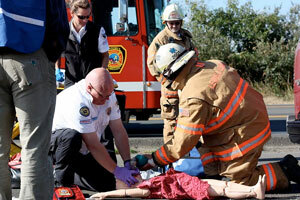 EMT-certified firefighters respond to all EMS calls and can provide care such as resuscitation, defibrillation, bleeding control and patient stabilization. Because rural ambulance services may be located in towns 15 to 20 minutes away, the firefighters are often first to arrive at an EMS call. Unfortunately, there doesn’t appear to be an answer to that question. What rural patients can expect in terms of pre-hospital care still depends greatly on where they live. *In March 2016, the Institute of Medicine changed its name to be the Health and Medicine Division (HMD), National Academies of Sciences, Engineering, and Medicine. This entry was posted in Features and tagged Cardiovascular disease, Community paramedics, Emergency medical services, Emergency medical technicians and paramedics, Health conditions, Healthcare workforce, Maine, Minnesota, Oregon, Service delivery models on August 16, 2012 by Rural Health Information Hub. Rural Monitor articles published prior to March 2015 were in quarterly issues. Browse the Rural Monitor issues archive. Reprint Policy: Articles, photos, and charts appearing in the Rural Monitor may be reprinted with the permission of the Rural Health Information Hub and proper citation. For permission, please contact kristine@ruralhealthinfo.org. Tell your colleagues how RHIhub can help them. Join us in spreading the word!